When a stand-up is coming up, they work toward getting a "tight five," referring to five minutes of killer material that's ready for a late-night set. 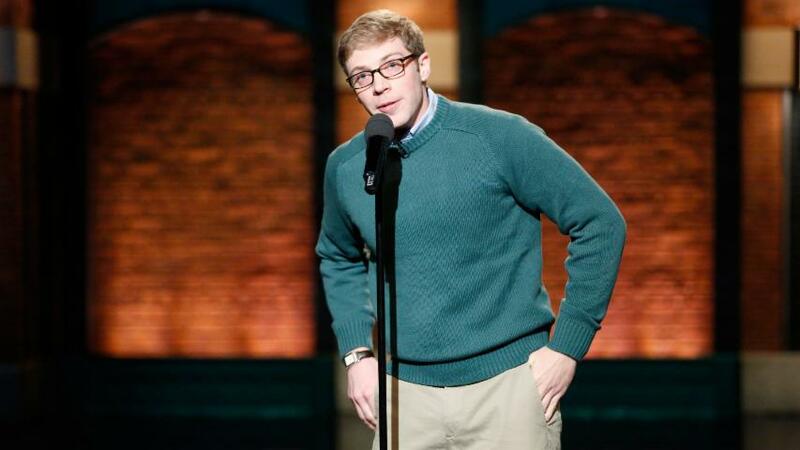 Joe Pera is not a "tight five" sort of comedian. Gentle and peculiar, Pera performs at a pace much slower than you'll normally see on TV. (So slow and calm, he made a usable sleep-aid video for Adult Swim.) But what's so great about his performance last night is that Pera didn't alter his style for television, he made the audience adjust to him. I've seen Pera perform a bunch of times in New York, so I knew what to expect. What's so impressive here is that Pera is able to convey his persona so succinctly to the audience that by the time he says – talking as a person talking to him – "a cool guy like you," the audience laughs louder than they had before. My favorite detail is his hands: He spends almost the entire set nervously almost putting them in his pocket — it's a clever way to create pre-punch-line tension. And that a cappella joke! Late-night audiences tend to not be the best for comedians they aren't familiar with. If you watch any comedian's late-night set, regardless of the show, you'll hear some medium laughs and a lot of (likely cued) applause breaks. Toward the end, Pera gets both the loud pop laughs and the sort between-joke rolling laughter you'd see at a real comedy show. And the laughs are truly deserved.